In the wake of the decision to build hydropower schemes up into the wild land in Glen Etive, Mountaineering Scotland has written to Scottish Ministers urging them to take a more robust stance on policies which have been put in place to protect wild land and landscapes but are in danger of seeming toothless. 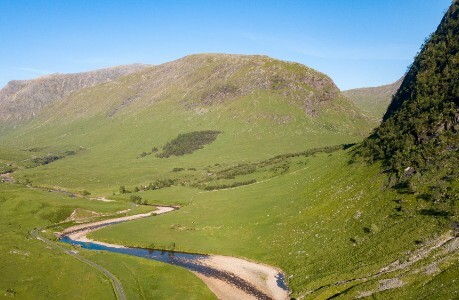 Before the shouting has even died down over the three Glen Etive hydro schemes, news has emerged that a similar scheme on the Allt Mhuic by Loch Arkaig has been reviewed and granted permission. The planning committee refused this one for the impact of development in wild land, only for this decision to be overturned by the Council, for local energy generation considerations. As a result a butterfly reserve, with populations of the nationally important Chequered Skipper, is potentially at risk, and another wild land area will cease to be wild as pipelines are dug into steep hillsides. This situation asks questions of the national agencies, planning authorities and the Scottish Government, not about the planning process as such, but about the issue of the weight and balance given to competing policies. In these cases renewable energy generation was pitched against landscape protection, and local interest against national significance. A key point in all this is whether the construction access roads, cut into a sloping and undulating landscape, can ever be reinstated to what they were prior to construction. Many projects have been delivered with results of varying quality, with obligations for reinstatement and restoration dependant on the ability of contractors to deliver on planning conditions which are often not monitored due to a lack of resources. This adds real uncertainty to the ability to properly evaluate the consequences of planning decisions. Fundamental questions need to be asked about our landscape protection polices: asked strategically about the ability of sensitive mountain landscapes to absorb development after development with the associated impact on their special qualities. We need a review of how landscape is valued, assessed, and protected, so that the appreciation of our wild and scenic places is not diminished or even lost to future generations. By all means harvest and harness natural resources, but as society we must take care and beware of over-exploitation and damaging what we take pride in.